TIRE SWING TRAVELS: TRAILER TRASH!!! Well it happened. I know, you've been thinking it all along. It has now been confirmed. Judy and I are nothing but TRAILER TRASH. 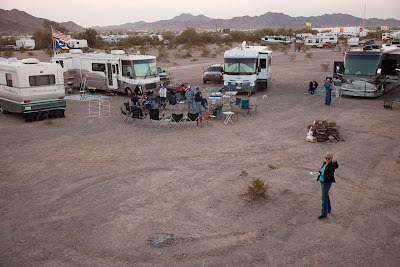 After my rant yesterday I knew I needed to repent and accept Quartzsite for what it is and more importantly what I am. The RVA group which has graciously and warmly accepted Judy and me into their little circle tonight made it official. 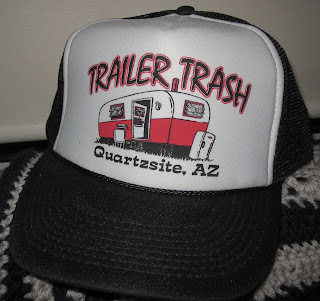 Five of us were inducted into and from henceforth shall be known as Quartzsite Trailer Trash. There is no higher honor they could bestoe on us. Come to think of it, there is no lower honor either, but that's beside the point. 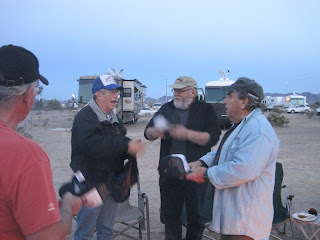 So ended another day in Quartzsite. 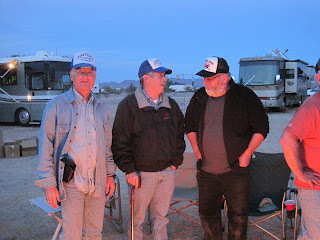 Sitting around the campfire, sharing food, stories, and even a few lame jokes. As a former boss of mine use to say..."beats getting poked in the eye with a sharp stick". Until later.